“tracker” and occupy the hot seat. Innovative South African wildlife training company EcoTraining is going international, setting up a branch in Australia. 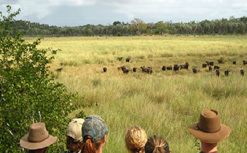 The first camp will open in the Bamuru Plains area next to Kakadu National Park Region in the Northern Territory near Darwin in October 2008, offering a field guide course, with plans to add birding and indigenous culture courses. EcoTraining was started in 1993 by a group of bush guides from Londolozi and Sabi Sabi who realised that, with the end of apartheid, international tourists would pour into South Africa. And, they reckoned, wildlife and safaris would be a big part of the attraction. While food, décor and position play big role, it is the quality of the guides that sets a game lodge apart. 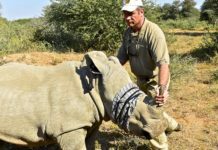 So EcoTraining began to run the first structured field-guide training course in South Africa, with a dedicated venue, a comprehensive curriculum, and instructors who cut their teeth at the finest game lodges in the country. 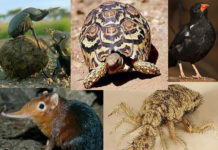 Around the same time, the Field Guides Association of South Africa (FGASA) was set up to – among other things – standardise field guide qualifications. Anton Lategan joined EcoTraining as an instructor in 1997. By the end of the year he and veteran field guide and wildlife photographer Lex Hes had teamed up with to buy the company. At the time they operated from a corner in the north of Sabi Sands with one Series 3 Land Rover, one bucket shower, one pit toilet and a few tents. They’ve come a long way since then, with three dedicated camps, but they’re definitely not planning to go the luxury route. The camps are not fenced, and it’s happened more than once that course participants couldn’t get to the showers before supper because a small herd of elephants were snacking on the trees near the ablution blocks. But that’s what it’s all about. It’s part of the strategy to remind aspirant guides that they are an integral part of nature. 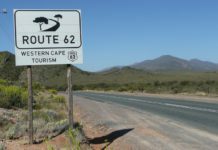 The company offers a range of courses, including special interest courses such as birding, animal tracks and trailing, and wildlife photography. A course popular with both tourists and locals who fancy getting to grips with the bush is the Eco Quest course, on which trainees learn how to track, drive a 4×4, and approach dangerous animals in the wild. The emphasis is on getting a better understanding of nature and of animals, but it’s not tied to a career path. 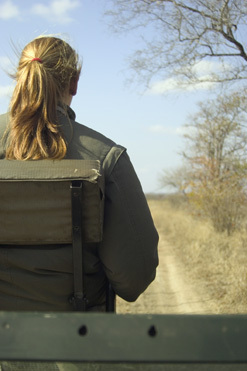 The mainstay of the company, though, is the field guide courses – Level One, Level Two and Trails Guide. These 28-day courses comply with the regulations and standards laid down by the Tourism and Hospitality Education and Training Authority, and the South African Qualifications Authority. But not everyone who does these courses wants to work as a guide. Some attend for their own personal development, and an opportunity to really learn about the bush. One such person was Mark Hutchinson, an Australian who visited South Africa to do the Level 1 course at Karongwe in the winter of 2006. He not only had a great time, he also saw the potential of the EcoTraining model, and approached the owners to negotiate setting up a branch in Australia. This was not EcoTraining’s first venture beyond South Africa’s borders. Of the 2 000 or so people the company has trained, a number are from Botswana, Namibia and Kenya. Some students are school leavers, others postgraduates, and some illiterate. Course participants span the spectrum from wealthy gap-year kids from Europe to rural people from African villages. 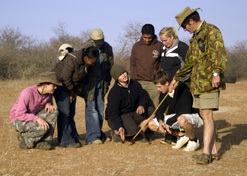 EcoTraining aims to reach a wide audience with its conservation message through guide training. EcoTraining Australia is a partnership between Anton Lategan and Lex Hes of EcoTraining South Africa, and Australians Mark Hutchinson, owner of Fishabout Tours and Untamed Tracks, a travel audiovisual marketing company, and Charles Carlow, owner of Wilderness Australia, which runs a number of upmarket lodges. Plans are afoot to build more camps in Australia to take advantage of the extensive wilderness areas, the fascinating cultural heritage, and the abundance of interesting animals and plants. EcoTraining also plans to set up something more permanent in Kenya, and are negotiating with interested parties to set up bases in the Zambezi Valley. 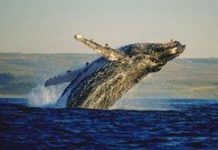 While field guide training is important to the tourism industry, there is a more serious reason to do it as well. “EcoTraining is uniquely positioned to play a role in conservation through our professional network, our experienced team and our commitment to our mission of teaching people about the natural environment,” says Lategan. When asked about expansion plans, smiled and said, “We are a humble organisation with a serious mission, and an excellent foundation to build on. So yes there will be expansion, but I don’t see expansion as growth for growth’s sake. The natural world is being destroyed, and we need to stand up and be counted in whichever arena we are needed. Do you have queries or comments about this article? Email marya@mediaclubsouthafrica.com.